A premiere retailer of 100% authentic designer handbags, accessories and other fashion, Rodeo Drive Resale (http://www.shopRDR.com) offers great deals on exclusive items by St. John Knits. Founded half a century ago by husband and wife team Robert and Marie Gray, upscale fashion brand St. John Knits has come a long way. What began as a modest merchant of knit suits and dresses quickly exploded into an industry powerhouse. Today, Rodeo Drive Resale (http://www.shopRDR.com), premier seller of 100% authentic guaranteed Chanel bags, Gucci heels and the world’s largest reseller of discount St. John Knits, is currently promoting its St. John Knits Valentine' Day promotion offering amazing savings on the popular clothing line. Though the label has had several lines come and go over the past several decades, shopRDR.com still carries much of the most beloved designs by St. John Knits, including santana jacket & skirt suits, red stretch twill jackets, as well as floral and crotchet items. In addition, shoppers can save up to 20% off select purchases now through Sunday during a special three-day event. 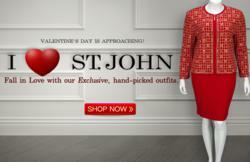 “Women who fell in love with the original St. John can still find past coveted collections at shopRDR.com. On our site, you will also find a well edited selection of newer styles up to 75% off retail,” Raya Jaffer, co-founder of shopRDR.com said earlier this year.